A redox reaction occurs when a solution of an oxidising agent is mixed with a solution of a reducing agent. 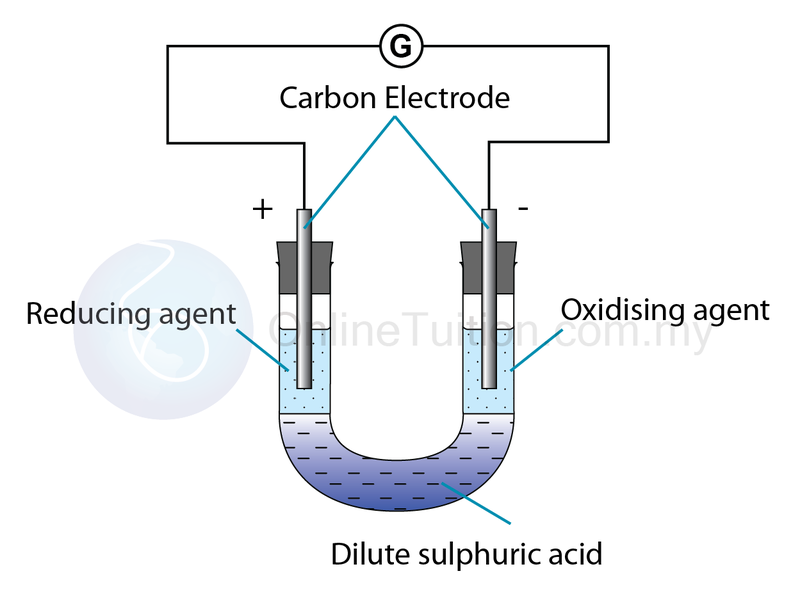 If the solution of the oxidising agent and the solution of the reducing agent are separated by an electrolyte in a U-tube, the redox reaction will still take place but the transfer of electrons will occur through the connecting wire. The reducing agent undergoes oxidation with the loss of electrons. So, the carbon electrode that is immersed in the solution of the reducing agent becomes the negative cell terminal. 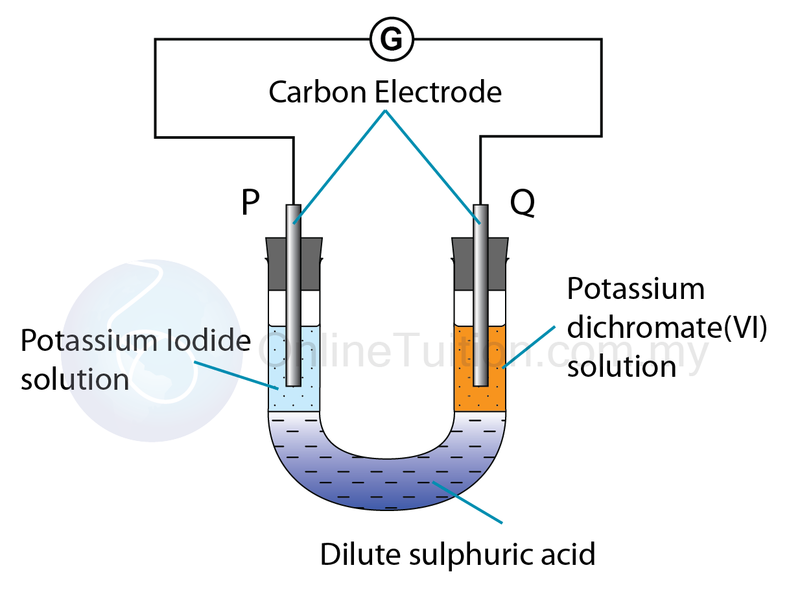 Electrons flow through the connecting wire to the carbon electrode that is immersed in the oxidising agent solution. 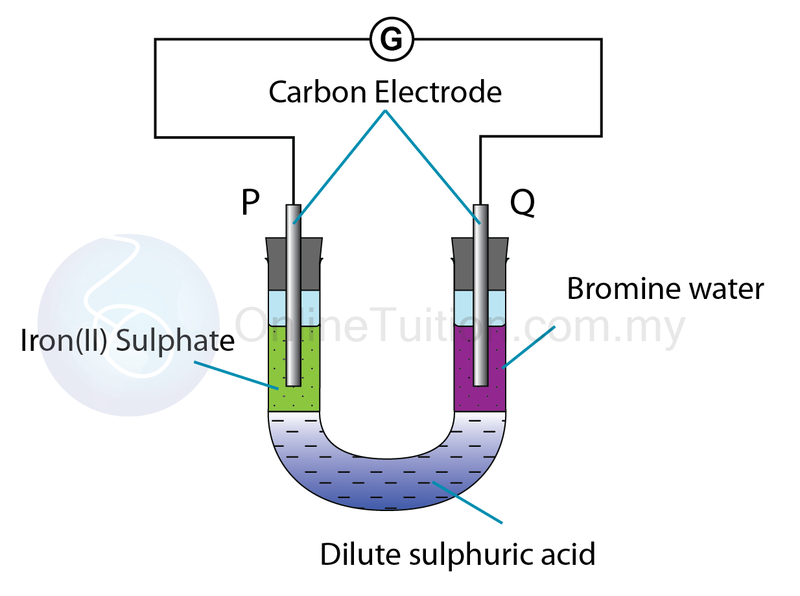 The carbon electrode acts as the positive cell terminal. The oxidising agent undergoes reduction with the acceptance of electrons. Oxidation always happens at anode. Reduction always happens at cathode. Anode is the negative terminal. Cathode is the positive terminal. Observation: The colourless solution turn yellow/orange. Note: Potassium iodide is colourless whereas iodine is yellow or orange in colour when dissolve in water. Observation: The orange colour of the solution turn green. Note: Oxidation occurs at anode whereas reduction occurs at cathode. Note: Anode is the negative terminal whereas cathode is the positive terminal. Step 5: Determine the Direction of Flow of Electrons. From electrode P to electrode Q. Note: Electrons flow from the negative terminal to the positive terminal through the wire. Observation: The green colour of iron(II) sulphate solution turn brown. Note: Iron(II) ion is green in colour whereas iron(III) ion is brown in colour. Observation: The yellow/orange colour of bromine water become colourless. Note: Bromine is yellow/orange in water whereas bromide is colourless.